It's cold outside. But not here! Yes, it's Umhlanga in winter. So it's a good deal warmer than - well, almost anywhere else that isn't directly on the equator. In fact, in recent weeks we've even had people splashing in shallows and surfing the swells that grace the view from our gorgeous Anchor's Rest deck. This wonderful warm weather has brought its share of unseasonal surprises. The rain we so badly needed has fed our parched gardens, and the riot of green everywhere we look is a potent disguise. You'd never think it was winter. So yes, folks, it's cold outside ... somewhere else. But we're warm and toasty here at Anchor's Rest. And our warm and welcoming winter weather is only part of the reason why. The real reason we're feeling so warm on the inside, is because of the amazing opportunity we've had this year to invest in our local community. You see, there's something about us that you may not know. Of course, by now you're well-acquainted with Peter and Cilla's infamous hospitality and perennial good cheer. But did you know that her husband and Anchor's Rest co-founder, Peter, is the chairman of Umhlanga Tourism? His heart, like Cilla's, is with the people of this beautiful town - the true beneficiaries of local tourism and growth. In fact, we feel so strongly about our duty to invest in the community that we've teamed up with KZN-based training company, Tourism World Academy. This development-focused team has been charged with implement the locally-brewed hospitality learnership programme, "Tourism Buddies" - a Department of Public Works initiative. Peter has even taken on the role of student liaison and manager. These students - unemployed matriculants are placed with host employers who host trainee staff for a period of nine months, receiving practical training and mentorship from these hosts .As the 'anchor man' for this year's 76 students, Peter monitors their progress, and makes sure they're learning as much as they can. The course wraps up with written exams that earn students the certification of Tourism Professional when they pass. And for the duration of their training, the Department of Public Works pays each learner a monthly stipend. So not only do they get first class, real-world training, they are able to start earning an income almost immediately. What a great way to get into the working world and develop a truly global, valuable skill. We've loved being able to contribute to Tourism/Hospitality Development in the province by providing hospitality skills to unemployed matriculants. Best of all, we all benefit from the influx of new, innovative ideas into our business from youth with a passion for this industry. Our fellow hosts have reported the same thing, and we're seeing the industry improve as a whole thanks to the investment in the youth of our area. 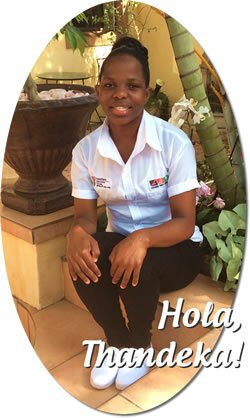 Thandeka's happy smile has graced us each day as we train her in the practical aspects of hospitality. We'll miss her when she goes, and we wish her well." There are so many ways we can contribute to a better world. With Tourism Buddies, we have helped at least one person have a better future. The programme is nearly over, but if you'd like to spend a night or two to get to know Thandeka and find out more about the programme, or even catch a rare glimpse of a cool Umhlanga day, don't delay. Book today!